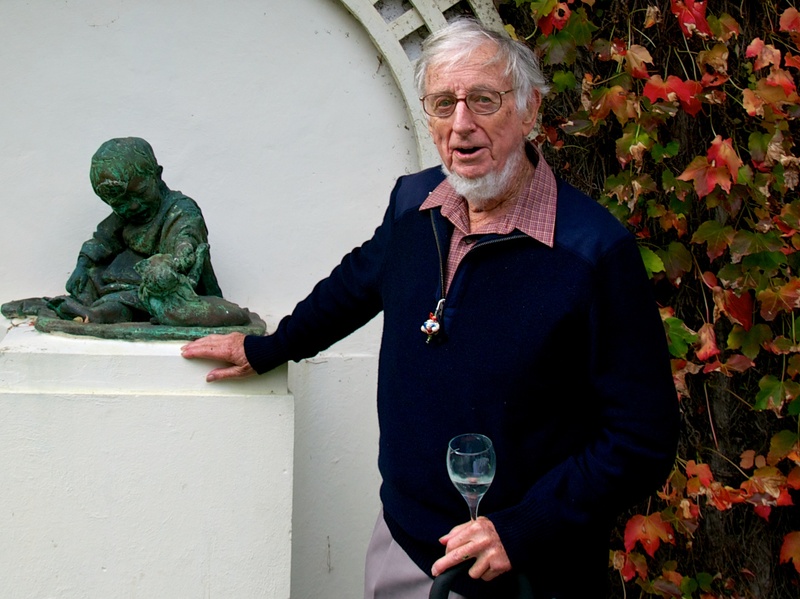 Our colleague Ian Waterhouse died on 21 August this year at the ripe age of 92. This obituary is drawn from the eulogies that were delivered at his funeral service. Ian was born on 31 May 1921 at Eryldene, a lovely colonial revival house in Gordon. trust and was clearly devoted to its upkeep and to making it available to the public. Ian’s professional career began when he won a scholarship to St Andrew’s college at Sydney University in 1939 where he studied psychology and anthropology, graduating with first class honours. By the time of his graduation in 1941, World War II was underway. He joined up and helped establish the Army’s psychology unit. They had a vast range of tasks from selecting suitable candidates, to post-war rehabilitation. We were not really adequately trained; but we did the best we knew how. Much was inevitably learning-on-the-job in wartime. In 1949 he was sponsored to go to Yale University in the US under a post war scheme for returned servicemen. He was awarded a PhD there in 1953. His experience at Yale included both experimental and supervised clinical psychology. A supervisor of his clinical work there said Ian, you have real talent for this work but one day you should make friends with psychoanalysis. In 1953 he returned to Australia and joined the psychology department at Melbourne University as a senior lecturer. Within a year he met Marie, then a secretary in the psychology department and studying to matriculate. Later she became a student in the department. About this time he did start to make friends with psychoanalysis. He began to train as a psychoanalyst with Dr Clara Lazar-Geroe, a refugee from Hungary, who was the only training analyst in Australia. For many years psychoanalysis was a source of intellectual stimulation, professional development in relation to clinical psychology, and collegial friendship around the world. Psychology staff to study in US. Melbourne University's Psychology Department is going to be short of staff soon. Four of its psychologists are going abroad. No department of this University has had so many fellowships at American universities in one fell swoop lamented Professor Oscar Oeser, the head of the Department. Dr Ian K Waterhouse was one of the four. Dr Waterhouse is the first Australian to be invited to an exclusive community of scholars in California called the Centre for Advanced Studies in the Behavioural Sciences. He will leave Australia next month but will get married first to Miss Marie Young a senior psychology student. Many of us know Marie both in her professional role and as Ians companion at our many social functions.They complemented each other very well: Maries energy and Ians patience; a shared interest in psychology both academic and clinical; Maries aesthetic pursuits with watercolours, pottery, and papermaking, and Ians love of gardening and of Eryldene; and a mutual love of travel, of friends, of family. So back to 1958. The Centre for Advance Studies in Behavioural Sciences in Palo Alto, near the campus of Stanford University, in the heart of what is now Silicon Valley was the site of a unique experience. The centre drew together each year 50 academics of excellence across many disciplines. Fellows at the centre while Dad was there included Thomas Kuhn the famous philosopher of science who was writing The structure of scientific revolutions; Ronald Coase, Nobel prize winning economist; and Willard van Orville Quine the great US analytical philosopher. But the experience of that heady intellectual environment eventually ended and it was time to return to Australia. The 60s were a time of great momentum for higher education in Australia. Student numbers grew five-fold. Macquarie University was among the new universities established. In 1966, Ian was appointed as Professor of Psychology and Head of the School of Behavioural Sciences, one of the university's four founding professors. They started in demountables in a cow paddock. They had the exciting and daunting task of establishing a new university from scratch. As head of the School of Behavioural Sciences between 1966-70 and 1974-79 he played the difficult role of integrating and treating fairly a broadly based school embracing Anthropology, Sociology and Psychology.So much of his professional life took place during his 20 years at Macquarie. He was known for his role in university administration, teaching and clinical supervision. Among his proudest achievements was the founding and directing of the Masters in Clinical Psychology program at Macquarie. This prepared students to become practising psychologists. The program is still going strong and it was and is highly regarded. He remained at Macquarie until his retirement in 1986. I first met Ian as when I was a candidate in psychoanalytic training. We would make our way through the labyrinth of the concrete blocks that was Macquarie Uni, to reach the Professors rooms. There we found an Aladdins cave of books on every wall and surface, testimony to Ians interests and learning, and I confess that interest in our little paper for the seminar often ran a poor second to my burning curiosity about the feast around us. It is worth dwelling a moment more on the significance of the Masters Course in Clinical Psychology that Ian established. It is very rare in Australia for a psychoanalyst to hold an academic position, unlike in Europe and USA. Ian and Prof Reg Martin at NSW Uni had that honour, and they were thus able to introduce analytic ideas to their students, and many have gone on to practice analytically in various settings, some undertaking the training as analysts. Ian played an active role in the life of the Australian Psychoanalytic Society, and became President at a particularly difficult time in its history. There had just been a Site Visiting Committee from the IPA, to help resolve long-standing conflicts in the group. Their recommendations led to major reorganisation of the structures and procedures of the Society and Branches, all of which needed to be embodied in a new Constitution and set of Byelaws. This Ian and his Executive carried out, and as President myself at the moment, involved in some modest developments of our Constitution and Byelaws, I am in awe of the task they took on, and of the thought and meticulous attention to detail that it called for. I learned at the funeral service that on camping and fishing holidays with the family, Ian was the one to untangle the fishing lines and sort out the contents at the bottom of the eskies. This, and no doubt his experience with the Byzantine intricacies of University politics, clearly prepared him well for our demands of him. I also remember him well at our business and scientific evenings, when a loud coo-ee would sound, and there was Ian , towering over us, calling us from social chit-chat to the business of the evening. I gather this was an echo of his own mother who would summon the family to table with a firm and commanding whistle. After his formal retirement from clinical practice, Ian remained a regular attendee at our meetings, contributing wherever he could, and always being present at the end of year gathering of the Sydney group. We could all see him becoming frail in recent years, but he always joined us with Marie at his side. And there he was last December, which was to be the last time.